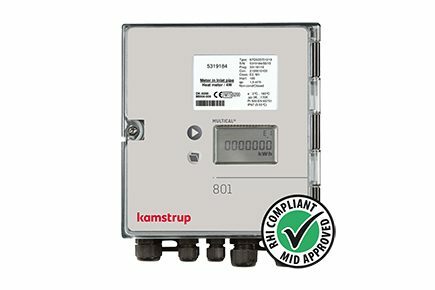 The Kamstrup Multical 801 is a robust and rugged Mid Class 2 and RHI approved calculator. Due to its IP67 sealing Multical 801 is robust and capable of functioning even in dusty and moist environments. High capacity, a wide temperature area, additional communication options, and several programmable functions make it the ideal energy meter for the commercial and industry segment. The Multical 801 is used for measurement of both heat and cooling in all water based plants with flow temperatures from 2°C to 180°C and with all flow meter sizes between qp 0.6 m³/h and qp 30,000 m³/h. The meter is easy to install, read and verify.